One odd thing we noticed is that the Samsung Galaxy S II cannot display SIM contacts – there’s simply no setting for that. You can import/export contacts to/from the SIM card but you can’t display them alongside the phone memory entries. We’ve seen that on other high-end phones as well (cough, iPhone 4, cough). Of course, the real flexibility of the phonebook becomes apparent when you sign into your social networks. After syncing, the phonebook will automatically merge contacts (you can do it manually too), so that the contact details are pulled from the social networks too. If you don’t need that, you can still opt for the phonebook to augment your existing contacts info with stuff downloaded from the social network cloud . 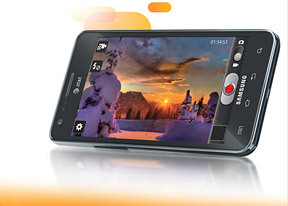 The Samsung Galaxy S II for AT&T had great in-call quality and the sound was crisp and loud. Reception was good and we didn’t suffer dropped calls though in areas of very poor coverage the sound would naturally break up. In terms of text entry, the Galaxy S II for AT&T offers you a whopping three options out of the box. First, you have the standard Samsung QWERTY keyboard, which offers very big and comfortable keys. In landscape mode, the keyboard takes up most of the display and the even bigger keys make it one of the most comfortable virtual mobile keyboards around. In addition to the above choice, you have the stock Android keyboard at your disposal, as well as Swype. All in all, you have a keyboard for every mood and occasion. Plus you can download more off the Android Market – there are both free and paid alternatives.